UML only supply to trade customers. For service kits please contact your Lifejacket Manufacturer, Approved Lifejacket Service Station, Local or Online Chandlers. Used extensively throughout the leisure & commercial sectors, the Pro Sensor® Automatic Inflator provides additional improvement on the standard MK5 Automatic Inflator, affording the user one point of status indication, to confirm that the unit has been automatically or manually activated. The unit also provides the added benefit of detecting if the Co² cylinder has been pierced, eradicating the possibility of accidentally fitting an empty gas cylinder. As with the UML MK5 Inflator the great benefit of this inflation system is that the there is also an automatic override which usually activates within 3 seconds of the system being submerged in water. The automatic cartridge contains a powerful spring which is compressed and retained in place using a paper element. When the paper element becomes wet, it releases the spring which pushes a plunger forward enabling a cutter pierce the Co² gas cylinder. The Co² gas from the cylinder instantly passes through the inflator head, inflating the lifejacket. Re-charge kits are stocked by most distributors of marine products. UML only supply to trade customers. REPLACE BY 10 2017 A = Replace By Month/Year (October 2017). Note the Letter printed at the end of the Year is not relevant to the serviceable date. Recreational Use: Replace every two years or by the REPLACE BY date whichever is sooner. It is recommended your lifejacket is inspected annually. Refer to your lifejacket manual and keep to service intervals. Commercial/Professional Use: Replace annually. Do not exceed the REPLACE BY date in any 1-year period. SOLAS approved life jackets are required to be serviced by an authorised service station annually. The Pro Sensor® Automatic Inflator is only fully operational when both green indicators are fully showing green, water is not restricted to the Cartridge Firing Mechanism, the Automatic Cartridge is within its printed Replace By Date and a fully screwed in full CO2 Cylinder in place. The CO2 cylinder must be checked each time you don your lifejacket to ensure it is tightly screwed in by hand. In addition, the cartridge must be checked to ensure it has not passed the replace by date and is also fully screwed on tightly by hand. The top indicator identifies the CO2 cylinder status. Red indicates it is missing or has been pierced. Partially red indicates the CO2 cylinder is not screwed in fully or has been partially pierced. REMOVE THE CYLINDER AND ENSURE IT FULL AND HAS NOT BEEN PIERCED BEFORE SCREWING BACK IN HAND TIGHT. The bottom indication identifies the Automatic Firing Mechanism status. Red indicates it is missing or has been activated. Partially red indicates the Automatic Firing Mechanism is not screwed on fully. 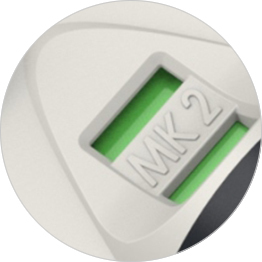 This product provides additional improvement on the standard MK5, affording the user one point of status indication, to confirm that the unit has been automatically or manually activated. The unit also provides the added benefit of detecting if the CO2 cylinder has been pierced, eradicating the possibility of accidentally fitting an empty gas cylinder. The indication system on the Pro Sensor® Automatic Inflator allows the user to establish if the system has been fired including the added benefit of quickly identifying if a pierced CO2 cylinder is accidentally refitted to the inflator during the servicing procedure. 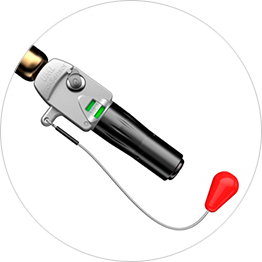 The Pro Sensor® Automatic Inflator indication is only fully operational when both green indicators are fully showing and water is not restricted to the Cartridge Firing Mechanism.